전남 영암지부(지부장:이께다 미찌요)는 왕인국화축제가 열리고 있는 장소에서 ‘지구가족사랑 1%운동’ 모금활동을 전개했다. 11월 23일에는 월산면 재활용수집으로 어렵게 생활을 하고 있는 지역 노인을 찾아가 일손돕기 봉사를 하였다. 또한 지역에서 어르신을 위한 쑥뜸 봉사활동을 꾸준히 진행하고 있다. 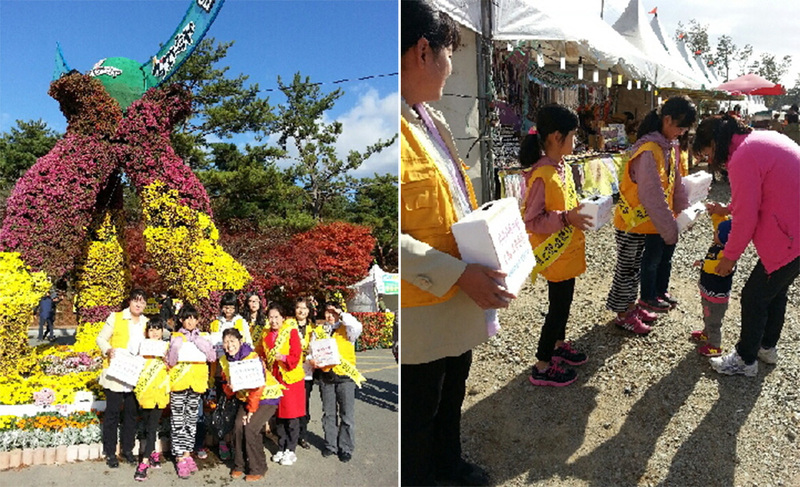 Yeongam Branch (Branch Leader: Mitsiyo Ikeda) of South Jeolla Province held a fundraising event for the ‘1% Love Share Project’ on the grounds of the Wangin Chrysanthemum Festival. On November 23, they visited the poor senior citizens of Weolsan-myeon who make a living by collecting and selling used paper and metal objects, and lent them a helping hand. In addition, the members also regularly carry out moxa treatment service for the elderly in local regions.